I was very happy to see that the schedule for this year’s Hillside Festival went up yesterday. Seeing as how it’s taking place in just two weeks out in Guelph, there are logistical issues to be sorted out – namely getting there and back – and knowing when to show up is certainly a big part of that. I’m actually kind of pleased that there’s not too much enticing happening on Friday night – hearing Chumbawumba play “Tubthumbing” on acoustic guitars isn’t as appealing as you might think – as it means that I’m not going to be fighting traffic to get out of the city on Friday afternoon. Instead, I can start fresh on Saturday morning, though even then the first must-see for me, Forest City Lovers, doesn’t go on till 5PM. That’s just of the acts I know, though – I’ll surely spend the earlier part of the day wandering between the stages and workshops just checking things out, soaking it in. Also on tap for Saturday, which is obviously the “rock” night, is The Besnard Lakes at 7, Dragonette at 8, Emily Haines at 9 and Shout Out Out Out Out at 10. 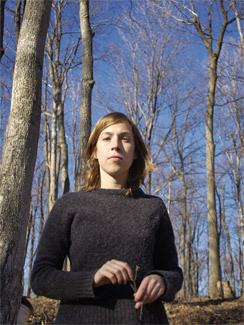 Sunday will get started early with Angela Desveaux, pictured above standing on a hillside, at 2PM. I’ve been meaning to check the Montreal singer-songwriter out for some time, her far too young to sound so old country having garnered favourable comparisons to Lucinda Williams and Gillian Welch, but she doesn’t seem to play around here very often. I actually just missed her last Summer during the indieUnlimited festival – I heard the PA announce that she was going on at one of the side stages just as I was heading home to have a nap. Won’t be making that mistake again. I’ll have to miss highly-regarded Maritime power-poppers Two Hours Traffic to catch her set, but will make that up this week as they’re playing a free show at the Horseshoe on Tuesday. eye has an interview. After Ms Desvaux, we’ve got Elvis Perkins at 4, locals The D’Urbervilles at 5 and Basia Bulat at 7. At 8, it’s a toss-up between Welsh outfit Los Campesinos! and Ohbijou, though I’ll probably opt for the latter since the former will be doing a free show at the Horseshoe on August 7. Then to wrap up, most of the fest will probably make a beeline for the mainstage to see headliner Ani DiFranco, on at 9:20. I suspect that Alejandro Escovedo was also supposed to be on at this time, but since he sadly had to cancel a few weeks back, they’ve now got Born Ruffians on at 10PM as an Ani alternative. Of course, staggered as those sets are, there’s no reason I can’t see both. For years, I’ve been hearing about how terrific Hillside is and have never been for whatever reason. Now that I can sort of visualize who and what I’ll be seeing, I’m getting pretty excited about the experience. It’ll also be nice to go somewhere that’s not completely paved over for a while. I think there’s a word for that… oh yeah. Nature? Anyway, you can make yourself useful by checking out a sampling of tracks from some of the artists mentioned above. And while Hillside is the best-known Summer festival in Guelph, it’s not the only one. Okay, technically Dog Day Afternoon (no relation to the Metric-headlined festival last year) happens in Elmira, but without getting into a semantic discussion of the geopolitical boundaries in Wellington county, we’ll just say “outside Guelph”. Taking place August 19 and now in its ninth year, it’s a one-day event on a farm that’s apparently so laid back, it makes Hillside look uptight. The perennial headliners are The Sadies, who’ll surely be previewing their forthcoming album New Seasons (out September 18) and this year, they’ll be joined by We’re Marching On, Shannon Lyon, The Bruce Peninsula, Tacoma Hellfarm Tragedy, Gurf Morlix and The Acorn. It’s a very small to-do but if you’re interested in attending, tickets are $25 and can be ordered in advance via the MySpace or by emailing dogdayafternoon@bust.com. Rock/Paper/Pixels was in attendance last year and called it magical. And dusty. Speaking of The Acorn, I’ve got an mp3 from their forthcoming full-length Glory Hope Mountain, out September 25. The record is based on the life of head Acorn Rolf Klausener’s mother in Honduras and is a bit of an unexpected direction for a band whose two previous EPs sounded I called “quintessentially Canadian pop”. But hey, if it sounds good – and it does – I’m not going to argue. Chart has some album details and Pitchfork has some thoughts on the song. Stars talk to Billboard about trying to capture the energy of their live show on their new record In Our Bedroom After The War, out physically on September 25 but available through most every online outlet right now. Patrick Krief, better known as guitarist for The Dears, will be playing a solo show on August 30 at the Rivoli in support of his EP Take It Or Leave which will be released on August 28. A full-length album is slated for early next year. eye reports that the Toronto Public Library’s concert series, launched last year in conjunction with their Local Music Series collection, will continue again this November. Huzzah. NOW considers this year’s Polaris nominees and decides they stink. Mandatory show announcement portion of the post – O’Death is at the El Mocambo on August 18, YACHT, Vampire Weekend and The Dirty Projectors at Sneaky Dee’s on August 25, Earl Greyhound is playing day two of V Fest, The Kaiser Chiefs, Datarock and White Rabbits are at the Carlu September 26 and Ted Leo & The Pharmacists are back at the Mod Club on October 7. He’s also got an October 5 show at Main Hall in Montreal as part of Pop Montreal, for those of you who are interested in piecing together the lineup for that fest. Like You Ain’t No Picasso, who’s got a laundry list of some of the bigger names confirmed for le pop du Montreal. Harp introduces and NOW, Cleveland Scene, The Montreal Gazette and eye interview St Vincent, in town at the Horseshoe tomorrow night with Scout Niblett. Pitchfork gets some details from Nellie McKay about her forthcoming record Obligatory Villagers, out September 25. WOXY has posted a video interview they conducted with The National during Bonnaroo last month. The National are at The Phoenix on October 8. The AV Club breaks down Ga Ga Ga Ga Ga with Britt Daniel of Spoon, from the title to the artwork to the copy protection on advance copies. Now that’s a thorough review. I’ve been to a few DDAs and loved them. I was wondering when information about the new one was going to spill out, as it’s about time for that. It’s a really nice farm, friendly people. I;m looking forward to this one! Wow, looks like a great line up, i saw Elvis Perkins play last week and he was excellent, check him out for sure !!! Seriously, thank about checking out Ndidi Onukwulu… she rocked the Winnipeg fest.